They found to be an important source of causing allergy in people. So, we should eliminate these cockroaches by using different techniques. 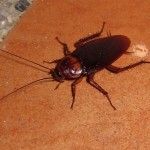 One way is to use baits and boric acid to eliminate your cockroach problem. Bug-Man can come periodically to monitor your home and help prevent an infestation with COCKROACHES.